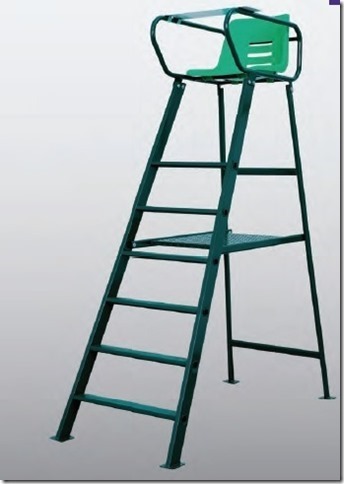 NJP SPORTS IS A WHOLESALE SUPPLIER AND MANUFACTURER OF WINDSCREEN AND TENNIS COURT EQUIPMENT. AS A CONTRACTOR, WE INSTALL WITHIN THE GREATER LOS ANGELES AREA. WE SHIP THROUGHOUT THE WORLD. IN BUSINESS SINCE 1971 - ON THE WEB SINCE 1996. WE WOULD BE HAPPY TO ADVISE, GIVE YOU QUOTES, AND SEND YOU SAMPLES AND A CATALOG. #2580 ALUMINUM UMPIRE CHAIR: The new standard for umpire chairs - this chair is light and collapsible, and yet comfortable for long matches. The chair sits at 6' tall. Includes: powder-coated frame, bottom rack, plastic seat, large steps, UV resistant, and writing desk. #2500 PLASTIC COURT BENCHES: A 5' long bench made of white or green polyurethane with slats that appears classical in style. May be bolted to the ground. Great for outdoor use. In business for more than forty-six years so we know about longevity and odd problems. Not all items are listed and additional fabrics can be used - ask if you do not see what you need.